Stuffed peppers were always a staple in my house, growing up. My mom usually made them once every other week, and I can still remember the taste of that delicious beef and rice filling! My kids love it too which is a HUGE plus. I also love how quick and easy this is to prepare, so it’s great for a busy weeknight dinner. I usually pair this with some fresh roasted vegetables and or a salad for a complete meal. 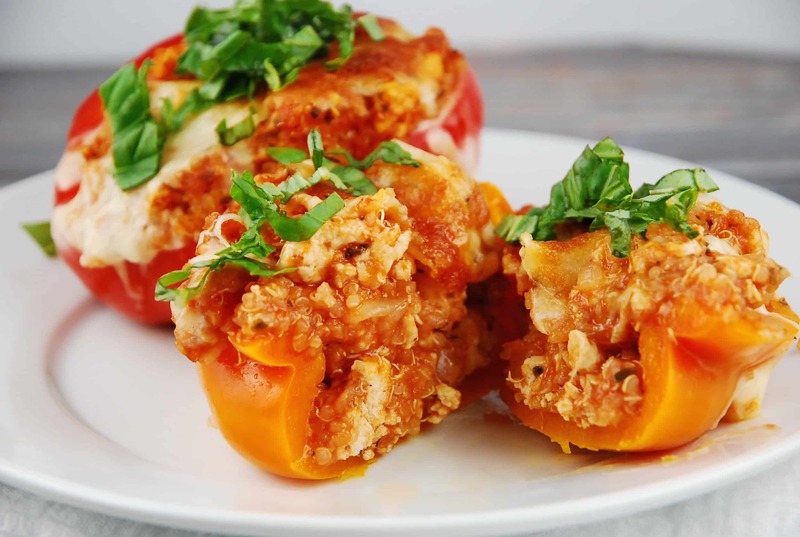 Decadent and satisfying, these stuffed peppers are filled with nutrition and fantastic Italian flavors. Complete with melted mozzarella on top, this meal is one of my family’s favorite. Preheat oven to 350, and coat a large 11” x 13” baking dish with nonfat cooking spray. Heat oil in a large skillet over medium high heat. Add in onions and cook until translucent, about 2 minutes. Add in chicken, dried basil, dried oregano, dried parsley and salt and pepper, and cook until meat is no longer pink. Use a wooden spoon to break apart the meat while cooking. Stir in tomato sauce, and mix to combine, Remove from heat. Combine the chicken mixture and the prepared quinoa in a large bowl. Season with additional salt and pepper as needed. Spoon the mixture evenly into each pepper half. Then top each one with mozzarella cheese (about 1 tbsp each). Place in oven, and cook for about 30 minutes or until peppers are tender and cheese is melted and golden. Top with fresh basil before serving.